Only Lovers Left Alive (5 stars). The movie “Only Lovers Left Alive,” written and directed by Jim Jarmusch, springs into my Top 10 of all films I’ve seen. Amazing. Rich. Delicious. Funny at times (this will be one area viewers will react differently — it might actually be more of a comedy than I took it for). I’ve come to think of Tilda Swinton as I do about Christopher Walken: both elevate any role and any movie, both have an extraordinary physical presence. I can’t imagine anyone else in her role here. However, all of the actors are great. As I watched this movie, I thought, I’ve got to tell John Stewart about this (he may recall I’ve mentioned it before.) Steve O’Neill will like this. Then, Jas Mullany, Riley, Marj, and Maddy — all the Mullanys, who at times are a single being like a gorgeous aspen grove. Here’s where Walking Raven will laugh (twice) and Merri Rudd will say “see, I’m telling you….” Eventually, the circle grew so large that, for a moment, I thought not only is this the best movie ever made but absolutely everyone will love. I’ve come down a bit — I know someone’s going to hate it, and, worse, someone will think “it’s ok, but what’s wrong with Mark.” I hesitate to watch it again. (That ruined Walkabout and Bad Timing for me, much to my sorrow decades ago.) I won’t watch it with someone else — I can’t bear to witness another person’s reaction, especially if it is disappointment. Although the movie is 90% unconventional, it veers into convention and predictability but recovers from that. We enjoyed this movie, filmed in Saudi Arabia by a female director. The lead actress is terrific. The film gently conveys how similar and how different life is between the US and SA. Looper is sci fi in the tradition of Blade Runner, even sharing a dystopian future. [I also detect a bit of Witness and the Matrix.] Of course, time travel is almost always difficult to wrap one’s head around. This is the best such tale I’ve seen since the Butterfly Effect (which was actually more disturbing). Naturally, the pairing of Bruce Willis and Joseph Gordon-Levitt is awesome, but the story itself is interesting and the dialog often clever. I can’t remember the last time Jeff Daniels seemed so good. Although there is plenty of gun violence (hey, this is America!) there are only a couple of scenes that were hard to take. This movie was charming and captivating. 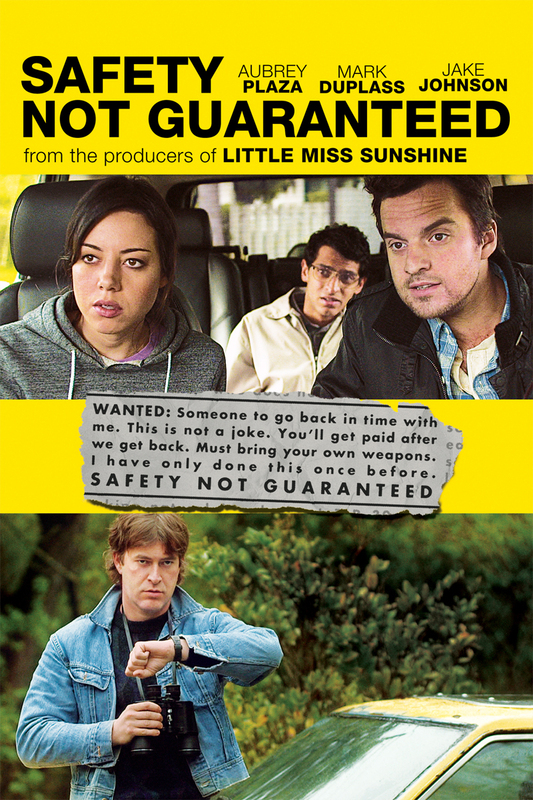 It’s a gentle comedy with a few actors we know through TV: Jake Johnson (playing the same character as Nick from New Girl), Aubrey Plaza (a sardonic beauty from Parks and Rec), and Mark Duplass, of the ubiquitous Duplass Brothers (including Jay) — they wrote and directed Jeff, who lives at home, another great comedy that makes you think. May the Duplass Brothers find ever expanding recognition for their talents. We weren’t sure what was going to happen down to the last scene. We watched Jeff, Who Lives at Home (Netflix streaming). This is a surprisingly effective slow and quiet film that starts out being about a slacker and his mal-adjusted family, but it becomes something much more moving. Everyone in the small ensemble is very good: Jason Segal (a favorite of ours), Ed Helms, Susan Sarandon, Judy Greer, and Rae Dawn Chong. I’m tempted to give it 5 stars — we talked about it a long time after — but it is almost too low-key for that. For many of us, all we need to know about a movie is that Christopher Walken is in it. But then, we’ve all seen movies that even Walken couldn’t save. But this is no cameo: Walken is the star of the movie and in nearly every scene. I think it is much to the credit of Alessandro Nivola that he holds his own toe-to-toe with Walken. Sharon Stone was a very pleasant surprise and a far more interesting character than you may assume on first blush. I recommend this movie. Finished watching 12 Monkeys for the umpteenth time. What a fantastic movie — one of the best. Bruce Willis always brings some believability to a role. Here he is quite amazing. Even more amazing: Brad Pitt, who surely deserved an Oscar. Madeline Stowe is also very good in her role. This movie manages a unique take on time travel and fate. Really wonderful. See it.